San Miguel is a fourth class municipality in the province of Iloilo, Philippines. According to the 2010 census, it has a population of 25,013 people. The municipality is bordered by Cabatuan in the north, Sta. Barbara and Pavia in the East, Alimodian and Leon in the east and by Oton in the south. 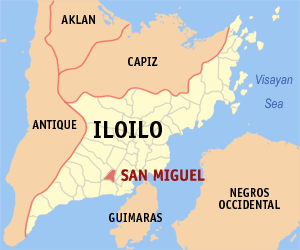 Southeast of San Miguel is Mandurriao district of Iloilo City. It is the site of Aganan River Dam, which is an agricultural purpose dam used for irrigation of the ricefields in the surrounding towns. Pepsi Bottlers Philippines Inc. has a bottling plant in San Miguel, which supplies Pepsi products in Panay Island.